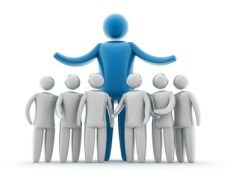 Company Partners Blog » To grow a business employ a “great one”. Whenever I hear advice from successful entrepreneurs the most consistent mantra is “always hire the best people you can afford”. But how good is “the best”, how do you measure that? Also, if you are in a young company, with very limited resources, how much can you really afford? Let’s step back for a moment though and examine that advice. Is it really the most important thing that a growing business should do? What about offices, buying equipment and developing the product or service, then there’s marketing, the best product is going nowhere unless people know that it exists. The answer may be that if you have good people aboard, they will help you get the operating essentials cheaper, faster, and of better quality. When you look at product design the difference between good and average has even more staggering claims. Mark Zuckerberg, of Facebook, suggests that some programmers and programming teams are 100 times more productive than their more typically talented peers. This isn’t because they can programme 100 times the number of lines of code, but because they write smarter code. These truly great programmers grasp what is needed quickly and transform that into efficient, supportable, clever instructions that enhance the original concept. What does this mean for the non IT side of businesses? Well the theory is still valid, if the multiplication factor may be less. Consider the likely results of an inspirational, highly respected and well networked senior figure in any sector of business, such as marketing, PR, raising finance, compared to an industrious but junior practitioner. Can you measure the impact of the great person against the average worker? The difference may be that you get funding, or not. That you become well known, or not. What is the measure and worth of these? I think we can all accept that the great person is going to do more for your company than an average worker, the question is what do you give up to be able to afford them? Do you take out loans, sell your house or divert funds from infrastructure to hire a great employee? It’s a balancing act, between all the calls upon your limited cash. The advice that successful entrepreneurs have given implies that you do all you can to get these few great people. If the immensely talented ones can ramp up your business fast, then you can start to readjust the balance so that other areas have cash made available. It is natural though to hope that even by using a less expensive resource you will still manage to make the break through. The lessons from very successful businesses however seem to speak against that.